This summer let your accessories do the talking! YOU are the stylish one no matter where you go or what you do. When you're wearing awesome accessories...your style rocks! Fun Fact: Accessories are a woman's BFF. Looking chic and stylish means your accessories are on-point. Without 'em...you are just wearing a top and bottom! Mind the gap. One of the best things about accessories is they have the ability to to bridge the gap. You can create different looks by simply changing your accessories. For example, a simple dress can go from everyday casual to a dressy night-time look by simply using different accessories. This means you don't need to have an extensive wardrobe! Clothes make a lot of demands. Our clothing demands closet space, wardrobe planning and financial budgeting. However, clothes are just the garments you wear...until you accessorize them. Adding one accessory is good, however the real glamour comes when you add the right combination of accessories! Another fab thing about accessories is that they don't make a lot of demands. The fact is, they are actually our "style helpers". There is no need to devote a lot of closet space for them or spend a lot of money on them either. You can get truly great accessories inexpensively! That's what this week's Style Article is all about. "Show Stopping Summer Accessories"--easy summer accessories (that won't HEAT YOU UP) and how to wear 'em! Style made simple. 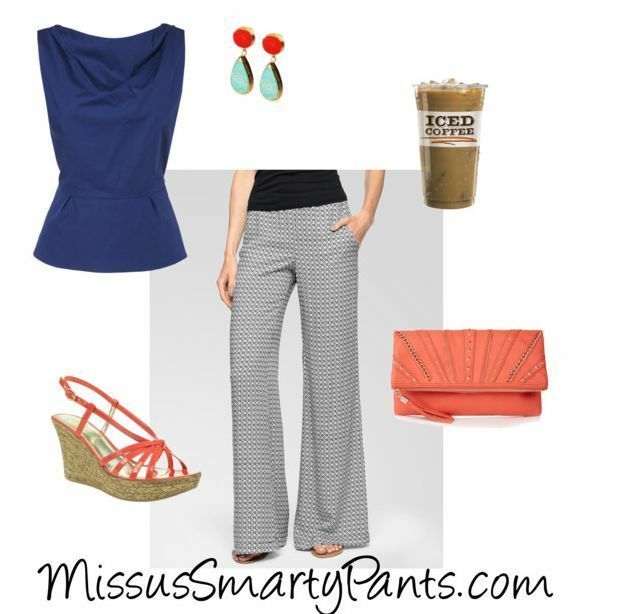 MSP (again this week) takes the guesswork out of being stylish! It's the accessories (along with the correct silhouettes for your body type) that makes you look fabulous every time you dress. This week, learn how to create stylish looks using the right combination of accessories. Find out how to put together the right pieces of jewelry, belts, scarves, shoes and handbags, etc. to your summer basics for some awesome looks you'll wear again and again. ***Get ready! This week's article contains lots of visuals to help you get that summertime stylish look you want! Join MissusSmartyPants and get this article + so much more! Pure, fresh and bright! That's how you'll look and feel when you complete this week's Style Mission. This week's Style Mission is to wear white jeans. Wearing cool white with caramel brown or gold accessories! White jeans are blank canvas that will give you a fresh, cool look this summer! Please don't stay hot and covered-up! There are shoe styles that can "slim" or minimize your ankles. Actually, one of the best and most flattering shoe styles that's a classic style is having a moment in the limelight. It's the d'Orsay. There are versions of the d'Orsay with ankle straps (these are never your friends!) and slip-on d'Osays (your style friends) in high-heeled and low-heeled (and flat) versions. As a rule of thumb, to slim your ankles (and legs for that matter) keep this rule in mind: the chunkier the ankle/leg the chunkier the heel should be. It's all about proportions--keeping things balanced. Also don't wear ankle straps because they "cut" your leg at your ankle (bringing attention there and making your legs look shorter/thicker). NO woman wants her legs to look shorter! 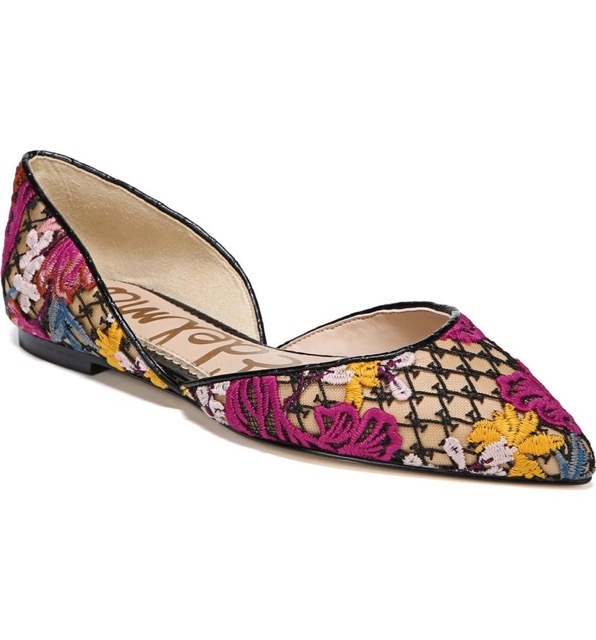 This d'Orsay shoe is always a stylish choice. Wear these floral cuties with skirts, crops and shorts...all summer long! No problem! Helping women dress for their current body is what MSP is all about. Dressing with your shape in mind gives you confidence…and nothing feels better than style confidence. Your body type has been changed to C per your request (at no cost, of course). Enjoy your style journey with us! Well that was fun MSP in the flesh! Great info! Yes, that was my thought too, a little shorter. I was just heading to bed last night when I saw your post. It was so much fun to "meet" you that I had to watch the whole thing! Good tips - I will use the scarf tip this weekend and will start pinning on some brooches to jazz things up! Have to say I really enjoy your tips and advice. You have really made dressing for work and play a whole lot more diverse, creative and pleasurable. I love my membership. Thank you for doing this. Yes, I am "Fashionably Fabulous At Any Age"! You have done it now, LOL! You have motivated me to get off my "franny" and finally get my style together. I am starting to believe I can do this style thing. I always thought it was for someone else that was prettier than me. You are making a believer out of me. I have had a syster membership for the last year, but since your eBook.... I figured I would seriously give it a try this time. Oh my, what fun I am having. I'm only on the first part of my makeover (hair) but I can see how this process you take us through is going to really make a big difference in how I feel about myself. (I am starting to cry now just thinking that I do deserve this). Thank you from the bottom of my heart for sharing your knowledge and your loving heart with us! Fondly, Stacey M.
I just signed up last week. I ordered some things from the Personal Profile shopping guide the week you were at Nordstrom. I am a body type E.
Thank you so much. I feel like I have not been attentive to my clothes and accessories in many, many years. Thanks for helping me get back on track. Thank you for helping me get it back together! I am a full time Mom with kids 13,12 and 10. I had not been looking my best… so I decided to try your service. This change has been an absolute revolution for me! I have not lost any substantial weight, but I have gotten more compliments than I ever did before kids. Weird, but delightful!! I didn’t even shop much as I went “closet shopping” and ended up just getting rid of a bunch of "schlumpy" sweats and baggy stuff that just made me look FAT. Now I am dressing for my "E" figure, I just feel better-Thanks! !